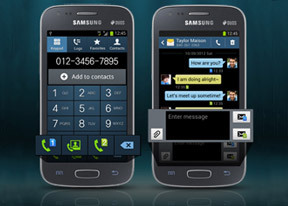 The Samsung Galaxy Ace 3 has a 4-inch screen of WVGA resolution (480 x 800 pixels). 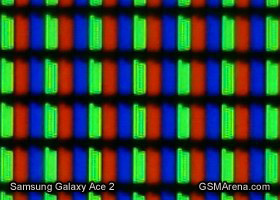 The screen is a bit larger than the 3.8-inch display on the Galaxy Ace 2, which results in a slightly worse pixel density (233 ppi), but makes operation so much easier since honestly, Android feels a bit cramped on anything less than a 4-inch WVGA screen. The larger screen allows for easier text input, for instance, as the keys of the virtual keyboard are not as small.. The WVGA resolution does not get stretched significantly by the larger size either, and we'd say the slight sacrifice to pixel density is worth the extra screen estate. Otherwise, colors are good as is the brightness, and we didn't see much contrast shift in viewing angles either. Overall, the contrast is not the best we've seen, but is good for its class. Sunlight legibility is the same story - nothing spectacular, but still good for an entry level device. 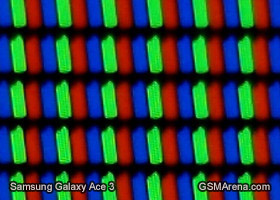 We also put the Samsung Galaxy Ace 3 screen under our microscope to show you its display matrix. It has the same inline RGB pixels as the Ace 2, although they're shaped differently and slightly tilted. The Samsung Galaxy Ace 3 is really easy to handle with its curved back fitting nicely in the palm of your hand. Given the friendlier, compact size, the slippery finish is a lot less of an issue than some of the larger flagship and phablet offerings from Samsung. Single-handed operation is a breeze as well. Our only complaint when it comes to the Ace 3 aesthetics is that the design language has been used by Samsung for almost two years now and it is already becoming a bit tiring and boring. Not to mention you would have a hard time distinguishing the Koreans' midrange smartphones apart just by looking at them. While this may be a certain advantage of driving sales (the affordable midrange phones look just like the company's much advertised flagship), the lack of product differentiating bears the danger of backfiring (making users look for an alternative smartphone that stands out elsewhere). Where's the fun in having your new phone look just the same as your old phone?